Made it. Italy. Finally. It was a long but pleasant flight. 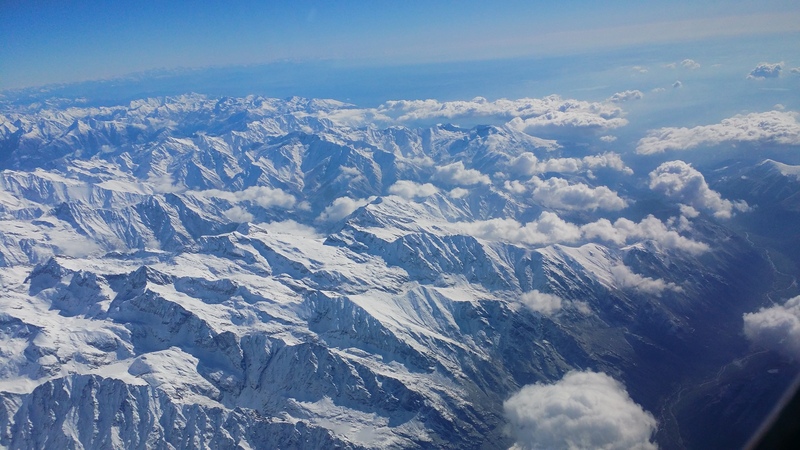 The Alps are pretty amazing from the air. Had my first cup of cappuccino in Italy….mmmmm so much better. Churches are extremely ornate no matter how small they are. 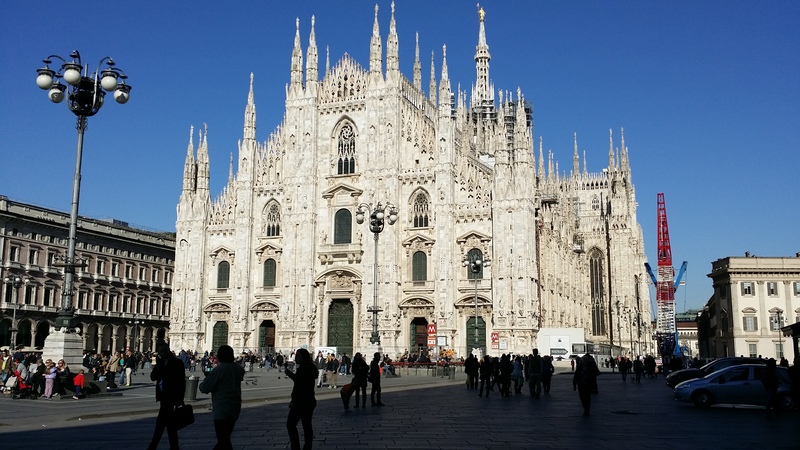 Saw Da Vinci’s The Last Supper today in Milan, as well as the Duomo of Milan. Absolutely outstanding. Every artist should see the last supper. Organization is poor here for now – running out of internet time. And getting tired! ….. a church I popped into on an evening walk in Turino. I’ll look up the name when I get a chance! Inside the Santa Maria Della Grazie Basilica – The Last Supper by Leonardo da Vinci is in an adjacent part of the church. Photos of course were not allowed of the Last Supper. But…. wow. The painting is huge. The walls around it have been restored after being bombed out in WW2. It’s amazing it survived through that and many more instances that contribute to defacing it – potentially adding to the painting’s notoriety. Only 25 people are allowed in at a time for 15 minutes of viewing. I feel very privileged to have been able to look at such a wonder. It was amazing to study it for that short time – dimensions, colours and detail. How fragile it is. It has faded greatly, even after restorations. I think every artist should strive for the opportunity to view it. I consider the moment a gem in my artistic career. Il Duomo – Milan. Just….. wow. So, I have a brief amount of time in Murano this morning before heading over to Venezia. 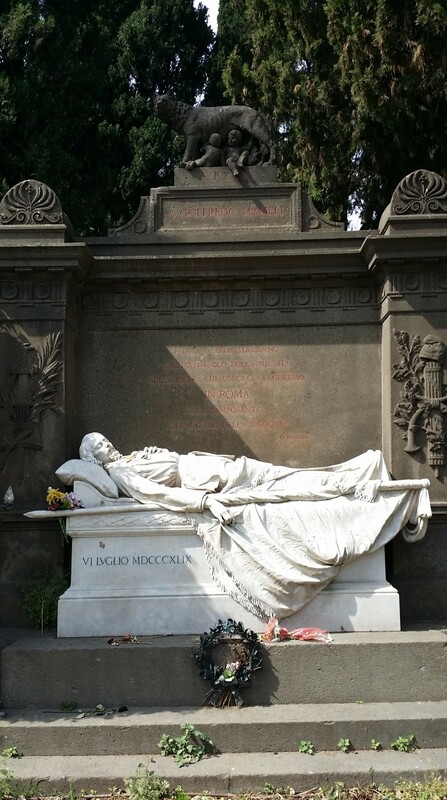 My plan was to walk over to the Monumental Cemetery as I had seen a few photos online I thought were intriguing. When I got there…. uuuuh…. I was like a kid in a candy store. There are thousands of monuments, ranging from smaller statues, to complex statues, to enormous family crypts that are so intricate in design, they should be a monument within the monuments! The place is undeniably beautiful! There is so much reference material here, I couldn’t stop running around investigating and photographing! And I ran out of time before I had even seen the whole thing! I have added this to the list as one of my favourite places on earth. I found this monument very powerful (among others). A husband and wife have lost their child, and relinquish the soul of their child to Jesus under the heavy shroud of grief. …… By 11 a.m. I was still gathering artistic reference material (that’s fancy talk for snapping photos like a star-struck tourist) on my way out of the cemetery. 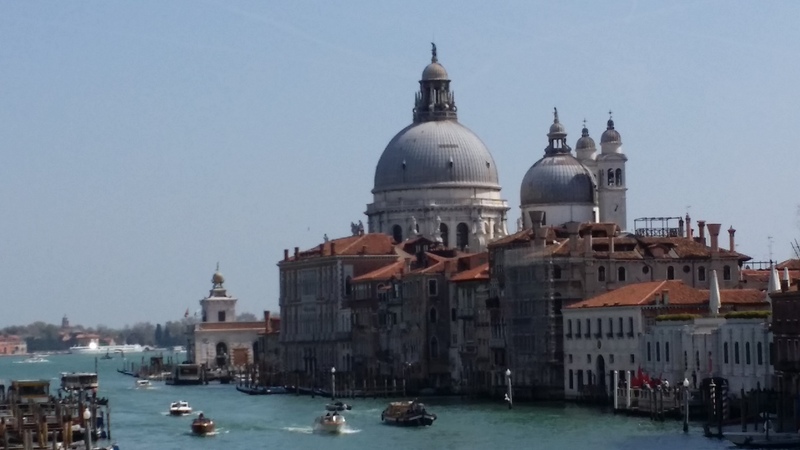 11 am – time to walk briskly back to the hotel, check out and catch my train to Venice! I know! It is just like the postcards! If you’ve ever thought about it but are still not sure if it will live up to its expectations… don’t think on it anymore. It does. Venice is one of the most intact, still occupied, barely changed and most ancient cities left in the world. Millions of people have walked the same cobblestone paths for hundreds of years, since candle-lit lanterns illuminated the narrow Calles (streets). From the time you step into the world of Venice, everywhere you look is history. Everything is interesting. I would walk and explore from 8 in the morning until 5 at night, then take a break, then walk until dark. I couldn’t stop even though my feet begged me to take a break! Here’s a map of the areas I’ve been – for your reference… and mine. Areas that I can recall walking.. or taking a water taxi. This is a map from Rick Steve’s Venice Guidebook. 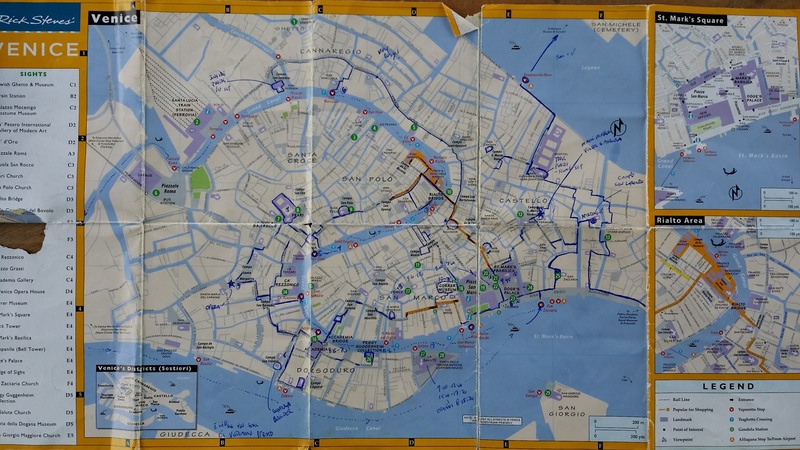 An ESSENTIAL tool and best map I’ve seen of Venice. There are so many things to describe, it’s difficult to know where to start. I tried to visit the main attractions right as they opened in the morning. St Mark’s Square (Piazza San Marco) is amazing. Huge. So many archways bordering the Piazza. St Mark’s Basilica is at one end, and the Correr Museum at the other, with the Campanile (bell tower) near the Basilica. There are few people in the mornings – an excellent time to just absorb the grandeur of the place. It’s so impossible to imagine the architectural decision-making that must have occurred when planning all of this. Millions of tonnes of stone supported by wooden pilings. How could they have created such a wonder so long ago? And now, we are all privileged with the opportunity to revel in it, should we choose to do so. I am completely in awe. What a world wonder. Trattoria Sempione – I actually can’t recall where I found this. Gondola traffic jam – oh no… how could life get this bad? I was fortunate enough to get an apartment for my 5 day stay in Venice. Although I tried to leave a trail of breadcrumbs to find my way back and forth from my home base, there’s just so many pigeons, the crumbs were gone before I could get my bearings. In other words, you will get lost no matter what. But, in following Rick Steve’s advice, just look up for the sign postings and make your way back to San Marco. So I learned to navigate to my apartment from there…. by day 3. I was introduced by my Venetian host Paola to mask makers Victor and Angela, just northeast of Campo San Maria Formosa in the Castello district. Victor, among about 3 others left in Venice, is one of the oldest generations of mask makers remaining. He has been making masks for over 40 years. His daughter Angela has taken up his mantle and has worked with her father since she was a little girl – now 38. They take paper machete masks, add material, and then paint on their unique intricate designs. Every mask is like a fingerprint. Numerous hours go into their design. Made in Venezia. I spoke with victor a number of times over my stay. Venice is flooding – with tourists. Twenty years a go was so different, he said. Now “I Love Venice” trinkets made in China are being peddled all along the main thoroughfares. Sparkly glitter-covered masks are a quick and dirty sell. It all has its place though I guess. Sometimes that’s all you may need at the time. “Soon…” Victor said “…you would not be able to step out of my shop because there will be so many people crowded within the little street.” I can’t imagine what it would be like when the summer crowds hit. I truly appreciated his conversation, and the fact that he treated me like a visitor and not a tourist. And watching Angela work on the masks awesome. She’s a wonderful person and answered my relentless “How do you do this and that?” questions. There is so much to say about Venice, I’ll have to spit it out quickly to avoid writing a multi-volume encyclopedia here. Churches and basilicas are everywhere. Many look extravagant on the outside, many look like crumbling brick buildings. EVERY one of them are astonishing inside! Mind-blowing vaulted ceilings, frescoes, paintings, statues and marbled from floor to ceiling. The amount of gold on some interiors is astounding. You can get a Venice city card that for about 12 Euros, gets you entry into every church. Valid for a full year! I’ll have to look this one up – I passed by so many churches in one day! Every street corner is an artistic opportunity – and a tourist’s labyrinth. Every tiny bridge crossed is a painting in of itself. I don’t know how local street artists compete. Although I was inclined to talk to and eventually purchase a small acid etched print from an artist selling his wares. I could see that his work was above others in the area. He had reached professionally, was a Venetian and thus, his skill was evident. The bridge of Sighs – leading form judgement in the Doge’s palace to the prisons. One last look at Venice. Every time I passed by the Bridge of Sighs I had to grab a photo. I’m so lucky full on tourist season hasn’t hit or else I’d never have gotten the photos I did! On April 10th, I visited both the Peggy Guggenheim Collection of Modern Art and the Academia Gallery. First the Guggenheim. Wow do I ever have opinions on modern art. I don’t think I’ll ever understand it. If you have to explain to me what 2 lines mean, I don’t want to know. I passed by probably hundreds of millions of dollars in art value, but I can honestly say, I prefer my street vendor art for 35 Euro. An extensive collection of Mark Rothko, Salvador Dali, Pablo Picasso, Constantin Brancusi, Andy Warhol and Jackson Pollack were well presented. Nevertheless, I couldn’t help thinking that this was the kind of art we made in my grade 11 art class when we were teenagers and had no idea what to submit to our teachers. We learned all the names of the modern “masters”, I’ve seen it, and I remain unimpressed. I can’t help but think that art is somewhat a cult, where a leader declares something amazing and intuitive, and others eagerly jump on board fearing that their negative opinions could hurt their reputation, or the need belong to something is stronger than their will to reject it. Then I hit the Academia gallery. This one is full of ancient masters. And wow, some of the pieces were astronomically huge. Now you can tell how much effort went into the pieces, regardless if you like the subject matter or not. I was thoroughly impressed. And, as expected of historic art, the majority revolved around religious subjects. Speaking of which, the religious art in most churches is so dark! Not only in subject matter, but physically dark. I can understand why Da Vinci was trying to branch away from the norm of his time. Depressing! There are so many Last Suppers, Madonna and Childs, Pietas (taking Christ down from the cross) it’s stifling! It’s like saturating the wildlife market with too many loon pieces. And so, to contribute to the culture explosion I was being subjected to, as is common in Venice, there was an orchestral opera enhanced with a ballet performance (Opera Balletto) that happened to be playing the following night, April 11th. To top it off, the performers would be dressed in 18th Century costumes and Venetian masks. I’m an artist. Who would I be if I ignored such a slap in the face? I had to go. My first opera. It was performed in a small room of a Scuola Grande die Carmini Museum in Campo Santa Margherita. I had second row seats to an absolutely phenomenal performance. The opera singers (male and female) were clearly professional, performing Ciajkowski, Mozart and Verdi flawlessly. The harp player – yes a harp player – was mesmerizing. How can she now how to play this seemingly complex instrument? Incredible to see. Listening to opera at home certainly isn’t on the to-do list – but seeing it live, belted out by professional singers….. WOW! This is a must if visiting Venice. I decided to visit the small island of Burano famous for it’s lace-making. Murano is a closer island to Venice, famous for its glass which is for sale in most localities, however I read the colours of the houses of Burano were picturesque. A mild understatement. They are phenomenal. What artist can say the conglomeration of colour is uninspiring here? Another wow moment. The lace work was also phenomenal. I ended up inadvertently buying a few Murano glass trinkets here though – beautiful craftsmanship, with the glass maker working right in the studio. Continuing on the boat from Burano, I visited the island of Torcello – the original settlement of Venice. Unfortunately, the attracting landmark – the monastery – was under renovation, but that’s okay. It was amazing to see this piece of history. The inside was huge, and even had gold embellished frescoes that were absolutely huge, extending up it’s vaulted dome ceilings. It’s almost unfathomable how mankind could make such a thing so long ago. It’s mind blowing really. The place must have been filled with scaffolding, with artists of many generations painstakingly setting each fresco tile upside down in perfect order. Apparently malaria wiped out the majority of the population. Then activity shifted to Venezia. As the afternoon continued, I too shifted my own activity back to Venezia. It was my last evening here. I grabbed a sandwich to eat… followed by a pistachio geletto… and then walked into the late evening. The weather had been absolutely perfect during my entire stay, reaching about 20 degrees Celsius in the day – more in the sun. As the sun was setting I tried to absorb as much of Venice as I possibly could. I was clinging to the setting sun. Nooooo! Don’t go! 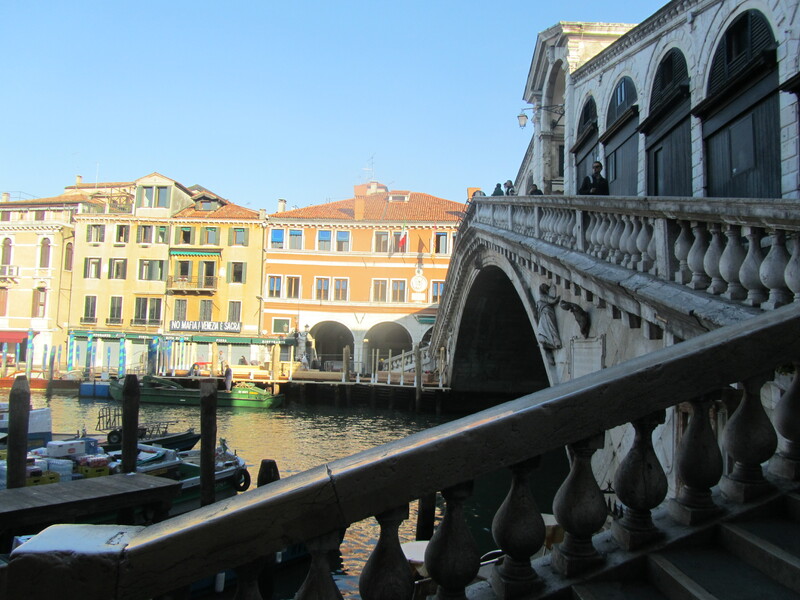 The following morning I said goodbye to Venezia – hopefully just “A presto” – I will see you soon. It’s only been 3 days, and I miss it already…..*sigh*. And so I go from the hustle and bustle of Venezia to Toscana – La Macina di San Cresci. It’s an Artist in Residence within a restored church (San Cresci). It’s located about 2 km west of the town of Greve in Chianti. Most towns on the map are followed by “in Chianti” in case there’s any confusion. Miraculously after getting off the train and with some previous instruction from my host… and google maps… I found the bus station, got on the right bus and arrived without getting lost! I arrived also to find myself the sole artist for the week! So much for constructive collaboration – something I was really looking forward to. After so much stimulation from dawn until dusk in Venezia, it was tough to fight off the sudden wave of loneliness. What to do, what to do. It’s tough to work on any substantial projects when you can only pack light around the country. Time to slow it down and smell the apple blossoms. The region is bound by very steep, high hills. On every slope facing any direction, hills of olive groves and vineyards. I believe that apple blossoms are out in full bloom. They are scattered here and there and add a nice splash of white flowers in the olive groves. Farmers are very busy every day pruning up all the olive trees. The piles of clipped branches are burn in the mornings, adding a surreal look to the valley with the temporary haze of smoke. The grape vines are also just starting to unfold their first leaves. But there are still pockets of forest where wildlife find refuge. I stirred up some deer on a few forest hikes so far. The birds – even just outside my window – are in full chorus. The soft repetitive sound of the cuckoo in the evenings is very relaxing. Many people also have flower pots out with beautiful blooming iris, wisteria and i’ve found some escaped lavender in the forest. In about 2 weeks from now, the trees will be in full leaf-out, changing the landscape dramatically. I dare to say the fall might be the best time to see this rolling countryside. I can just imagine what it would look like in those warm autumn colours, with a soft morning mist drifting at treetop level around the bend of a shallow, creek sculptured valley. Oh what I paint if I was an artist. The view from my dining table but…. wait… that’s weird… the bottle of wine is gone. Today, instead of hiking up, I hiked down. Okay I wasn’t hiking I was strolling through the countryside, going downhill. I’d be hiking up later. It was a few kilometres to town but wonderfully distracting scenery on the way. I hoofed it around the town of Greve just to see how it was laid out. 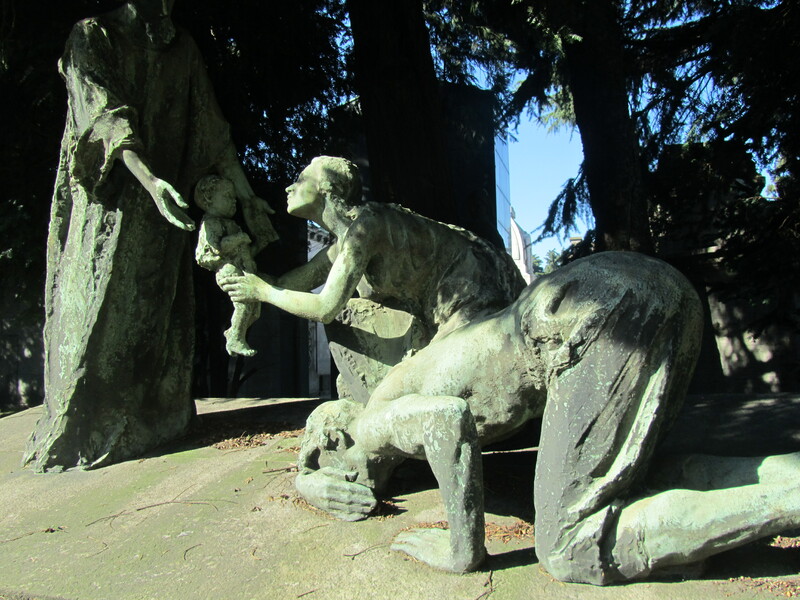 I went up the other side of the valley to visit the cemetery, then came back down for lunch in Piazza Matteotti. It’s a neat triangular shaped piazza, lined with cool food, flower and artisan stores crammed between all the little cafes. For me, lasagna and spritz. Delicioso. What? Do I have to eat a gelato for dessert? Fine! Make it a scoop of berry and a scoop of hazelnut in a cone and I’ll force it down! The grocery store I made the trip for was closed for lunch between 1 and 4 pm. Missed it and didn’t feel like waiting around an hour and a half. Meh, maybe tomorrow. So I found out that I was staying next to cooking celebrity! Stefania Balducci, originally from Arezzo, was now living just above Greve in Montefioralle, the walled medieval village just on the other side of the small valley across from La Macina di San Cresci. Learning recipes from her grandmother, she brought her outstanding Tuscan cooking skills with her, and as luck would have it, she offers lessons in her own home, and she had a spot left for me! Her business is known as Pasta al Pesto (http://www.pastaalpesto.com). After watching some videos and seeing the potential of what I could possible experience here, it would be foolish to ignore this opportunity. I’m there. Crystal glassware, warm candlelight and 50 bottles of wine. The perfect Tuscan ambiance. It was a very beautiful evening shared with three other couples. Joao and Bruna from Brazil, Jen and Joe from the United Kingdom, and Mike and Connie from the United States. We all united under the same kitchen tonight! Artichoke ravioli (from scratch), roasted fennel with parmesan, leek and fennel soup, Giulietta’s pork loin with milk for the secondi and an amazing chocolate cake (sans flour) for dessert! Oh, and in between, we eagerly drank up bottles of Chianti Classico from local vineyards to our heart’s content. Everyone was so grateful for the evening, a toast to our teacher was well deserved. A few days previously, I had the pleasure of being invited over to Stefania’s for an afternoon drink and conversation – a generous neighbourly gesture! With an apron, cook book (and cool little salt and pepper scoops!) not to mention a very memorable experience to take away from the evening, we all left much richer than we had come. When you’re in Chianti, look up Pasta al Presto and spend an evening cooking with Stefania in charming Tuscan style. Another gemstone! So as my time in Chianti came to an end, I spent my final evening with my La Macina di San Cresci hosts Demetria and Duccio, joined by local artist Irene Meniconi at a dinner hosted by Caterina and Gabriel. The dinner was excellent (graze Caterina!) and the wine was (needless to say) superb. The Chianti area reminds me so much like the Okanagan Valley of British Columbia where I’m originally from, it was amazing. There’s even pheasants crowing in the vineyards. The wild boars were a bit startling when I discovered them on a midnight excursion through the orchards though. La Macina di San Cresci Artist Residency – surrounded by olive groves, vineyards and abundant bird life to make mornings feel that much more alive. Florence. Wow. I was lucky enough to book Dei Mori B&B, which is a nice comfortable place easy to find in the heart of the city. I could walk to every major sight. Quite a difference to go from the quiet countryside of Chianti to the very bustling streets of Firenze. Of course, this was the tourist area though and expected. The afternoon I arrived I started hoofing it all over the city – back to the days in Venice! The first thing was to get a Firenze Card – 70 Euro. Galleries and Tourist spots are very reasonably priced compared to North America – usually below 16 Euro for the most popular sights, as low as 3 Euro for others. But the card offers the ability to get in straight away – minimal line wait and no reservations required ahead of time. This is key, and I valued my decision. After a bit of run around to get the card, I was right next to the Medici Riccardi Palazzo and stopped in. It was on my list as I’d seen photos of it previously. It was stunning inside. To imagine it back in the day likely alive with various types of flora scattered about… magnificent. The Medici were the prime bankers of Florence, and basically funded the Renaissance – rebirth of art and beauty that revived the country from the middle ages. The amount of wealth – represented by palaces, statues, artwork and churches – displayed by the Medici family was clearly astronomical. The billionaires of their time. 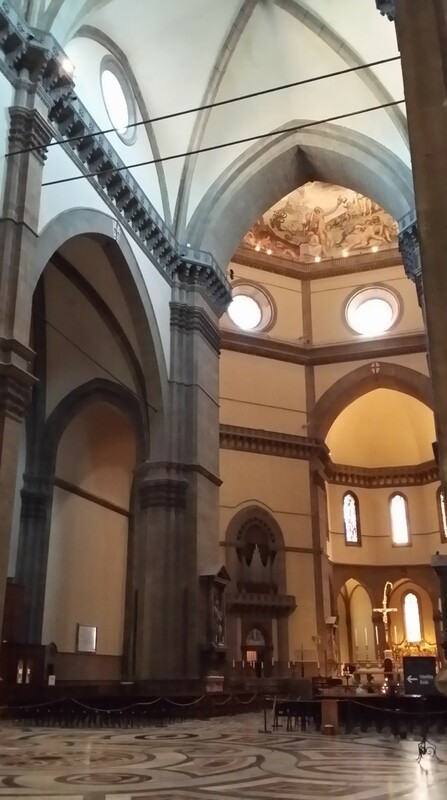 Continuing on, I checked out the Basilica di San Lorenzo, went to the Gallery Accademia (closed Mondays – strike one! ), Museo di San Marco (closed by about 1:30 pm), and then the Orto Botanico (botanical gardens). Doubling back, all I had to do was look for the Duomo and walk. I picked up a ticket combo for the Duomo, Basilica, Museo dell’Opera del Duomo (closed for renovations for a while) and Campanile (bell tower). The line for the Cathedral (which is free entry) was huge – keep in mind it’s mid afternoon by now. So I went to the Campanile, and climbed the 414 steps, which get narrower and narrower as one reaches the summit. So narrow in fact that one-way passage is pretty imperative as you spiral up in increasingly tight circles. This isn’t the place for those who feel claustrophobic I would expect! The following day included double-timing it across the city. Starting at 8:15 – the Baptistery. A brilliance of mosaic excellence surrounds the viewer in 360 degrees. Next, the 463 steps to the top of the Duomo. 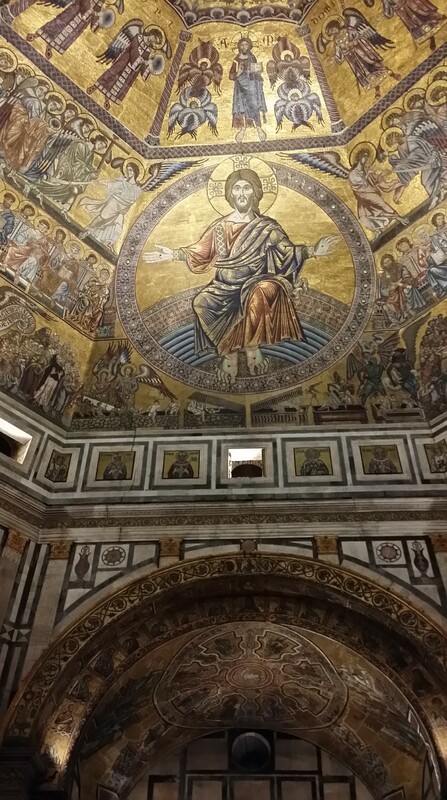 Whilst climbing up, the passageway includes a balcony that rings the inside of the Catheral of Santa Maria del Fiore, and you get a bird’s eye view of the chapels and seating areas. The inside of the dome is of course painted, surprisingly with hellish torturous images from the base to a heavenly bright ascension at the apex. The images though are truly gross – monsters eating humans, flesh being ripped from naked bodies to expose the interior muscles… you know… common gospel themes. The view from the top overlooking Florence is outstanding. The morning light was perfect. I believe it could be the tallest structure in Florence and you almost feel at a loss when you look around and can’t see the duomo – because you’re on top of it! Then I hit the Basilica di San Marco and continued on to potentially try to get into the Academia Gallery. Strike two! The line-up – even for the Firenze card entrance – was backed up down the street. Plan B – just… continue on. Stopping in at the Museo Nationale del Bargello, I doused myself with more amazing artwork of all kinds. Now time for the Uffizi. No stopping dammit! It was easy to get in with the Firenze card despite a minor wait for those with reservations. With the Firenze card, you just go into the “Reservations” line – often there is a sign of some sort outside indicating this is where card users can get in. Still – very busy! It is a massive, beautiful gallery formed in a squared U-shape. The hallways are long, consisting of hundreds of busts and sculptures, with artwork situated in the many side rooms. It’s decked out as a palace, I believe built by the Medici. Of course, the famous Botticelli “The Birth of Venus” and “Spring” are of key interest to the public, causing a swarm of people around it that included me! Evening time now, how about one more stop? Palazzo Vecchio? I was fairly museumed out by now, so I made a quick tour of the exhibits, visited the underground ruins/ foundations and climbed the third tower of the day. It was around 7 pm by now. Amazing view of the Duomo and the rest of Florence. Hmmm…. sunset…. in another hour! It would be great to see the Duomo lit up. Should I stay or should I go? I’m stayin’. Sunset was at 8:05 pm. A long wait. My camera battery was warning me to recharge it. Barely anything left but I managed to capture the evening Duomo. By the time I got down to the piazza, the battery died! And for the final day in Florence, I made it to the Academia to see the famous David by Michelangelo. Wow. Of all the legendary masterpieces, this is truly one of the few. As the museum was designed specifically to house this sculpture, it is clearly evident, as it is displayed beneath the skylit dome that bathes it in perfect lighting. One can’t help but get immediately drawn to it like a magnet. The sculpture is a lot bigger than I thought it was going to be. And the detail is phenomenal. It is in such amazing condition. I feel sorry for the rest of the art in the gallery having to live under David’s heavy shadow. 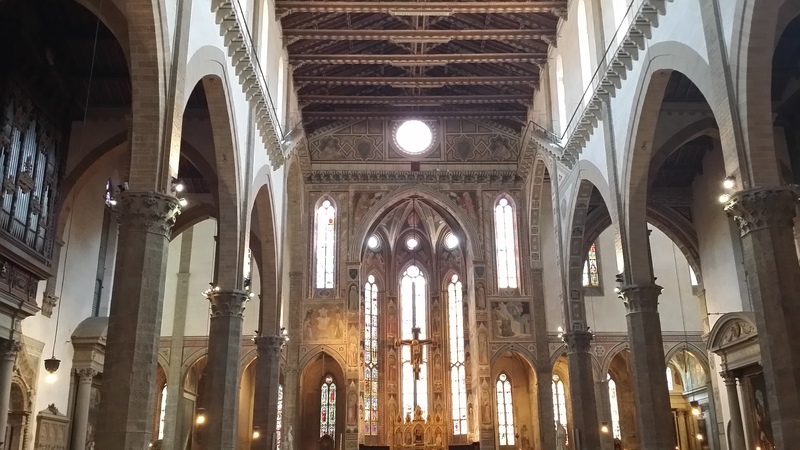 On to the Basilica di Santa Croce de Firenze – another huge basilica with an extremely impressive exterior and interior. Typing words to describe the beauty of basilicas and churches I’ve seen is almost futile in comparison to standing under their vaulted ceilings and feeling their atmosphere in person. 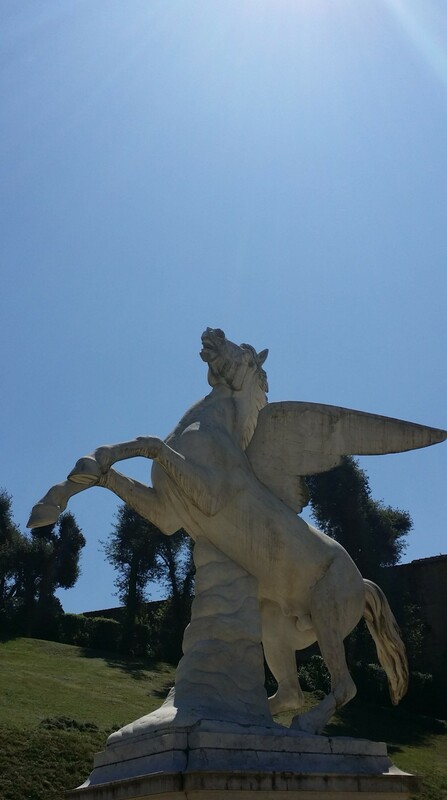 And finally on to the Boboli Gardens – a huge tract of manicured gardens just on the south side of the Arno River from old Firenze and Ponte Vecchio. Putting my endurance to the limit, I covered as much ground as I could in the hot afternoon. A very beautiful place, and a nice break from walking the hallways of interior museums. Ahhh back out in nature. The streets are pretty busy and it’s great to take a quiet break here if you’re in town. My time in Firenze has come to a close. I did what I could and was able to see more than I could ask for. A night at a gala reception with friends from Canada topped off my final evening, and I walked past the illuminated Duomo with my boots sounding lightly on the cobblestone streets. A beautiful night. Time to quieten down now. There was a place I had been looking at for over two years now. Before leaving Canada, it was my computer desktop wallpaper. And now I was going to be there. Civita di Bagnoregio is the tiny remains of an Etruscan village founded over 2,500 years ago on a volcanic plateau that has been eroding since its conception. Homes and buildings have fallen into the Tiber River valley below with the cliffs over the passage of time. There are Etruscan tunnels that are carved in the volcanic tuff beneath the village. The access to the town is now a fortified solid bridge – once a donkey trail on top of earth. The trail had been bombed out during WWII but luckily the town itself was not hit. An amazing timeline about this village is displayed on a website: https://prezi.com/sommzbu8rnd6/civita-di-bagnoregio-a-time-map/ . It’s listed as one of the top 100 most endangered places by the World Monuments Fund. Once down to a population size of 25 in the 1960s, it now varies from about 12 people in the winter to around 100 in the summer due to tourist fluctuations – the lifeblood of the town’s survival. A recent chunk of earth fell from the cliff only a month before due to continued rain. It was large enough to bury trees below. On the north side of the town. For those that do not speak Italian, it says “You fall, you die”. Besides having perfect weather throughout the trip thus far, I was awarded yet another lucky strike. I had booked two nights at Trattoria Antico Forno. The owner, Franco Sala has been operating the restaurant/B&B for about 25 years. A man with a great personality, he told me that things had changed, and I’d be put up in the apartment a street over instead of upstairs above the restaurant at no charge difference. He told me I was a lucky guy, and I have to admit, after being introduced to the apartment, I had to agree. It was amazing. Rustic, but with very nice living spaces, kitchen, great bathroom and two bedrooms upstairs, it was more than perfect (thanks Franco)! The view out of my bedroom window was just awesome. It couldn’t get any better, or more authentic than this. A glass of wine on the house, and a good meal started the afternoon. I then wandered the village – what streets there are left to wander, and yet still I managed to take several hundred reference photographs. Cats are plentiful. They certainly add life to the village. I especially appreciate their growling, snarling cat fighting at night (as does everyone else). Vines were scaling the walls and flowers were potted and displayed for all to enjoy. That evening, I was hoping for a good sunset. I booted it down and across the footbridge, and up the other side of the valley to a lookout point. Damn! Another hour till sunset! Reminds me of my evening stakeout on the Duomo from Palazzo Vecchio in Florence back in … oh … only a few days ago. But what a beautiful place to spend an hour. No one else crowding the view. There was a mix of heavy cloud in the west, and at one point I was fearing the sun may not show its rays in the final evening hour. But when in one second there was shadow, the next there was light. A golden hue radiated onto Civita, lighting it up as the centrepiece of the valley. Amazing. Heading back into the village around 9 pm, the light show was beautiful. There were some lights along the bridge, and illuminating the entry way to the village. And in the village, the lamps provided the warm backdrop on the stone walls against the fading blue skylight. Just inside the entry way, looking back. The door and windows of the left dwelling show there is nothing there. Everywhere I looked here was an opportunity for a painting. Such a small area is so full of opportunity due to its rich history and current circumstances. To reinforce the opinion of Rick Steves here, Civita is a gem. It is such a unique hill town, there is no other like it. Although it took a little puzzle solving to get up here, it was worth the effort. Oh yah, getting back down to the train station in Orvieto? Well, unbeknownst to me, I had forgotten to look into other holidays besides Easter in April. On the 25th is Liberation Day. No buses. If I stayed one more night… no buses run on Sunday either. It would also cause a financial loss due to cancellation and museum bookings I had for Rome. I had to swallow a big pill here, and take a 50 Euro taxi ride. It’s Italy. I let it slide. Civita treated me well and I was very happy to have been a part of its history. The final leg of the journey. Rome. A population of over 2.8 million people, likely a million more there illegally, and usually over 12 million tourists a year. Huge. I arrived on the afternoon of the 25th. 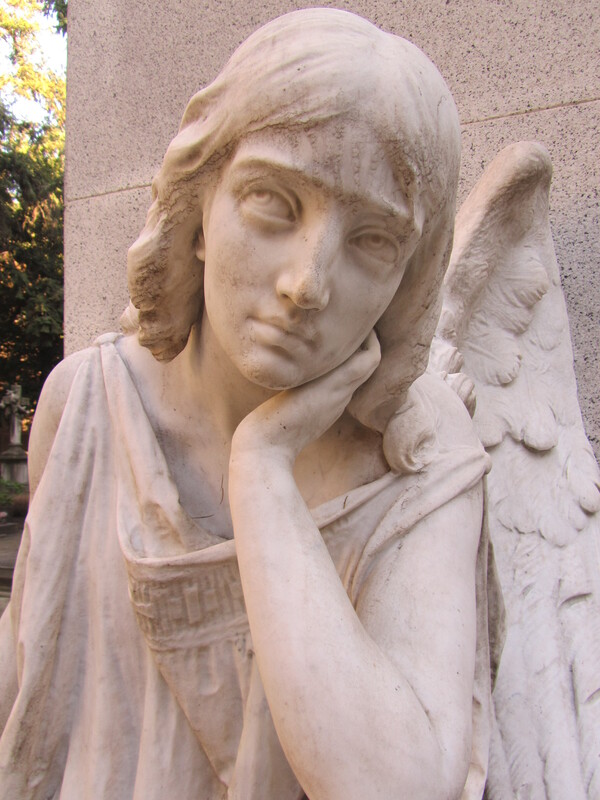 My first objective was to see the Monumental Cemetery of Verano. I was curious how it compared to the Milan monumental cemetery. Although I prefer the one in Milan, Verano was equally impressive. Enormous in size – at least twice the size of the Milan one I’m guessing. It too had phenomenal monuments to families and individuals. The Verano cemetery though had more of a humid, lush, tropical feel with many palms and vines. A good peaceful wander throughout the afternoon. I stayed into the evening until closing time. The following day, it was on to the Borghese Gallery. I had pre-booked the tickets online a month ago. Good thing too. Upon arrival, a posting on the door announced no tickets were available until Tuesday. A very popular sight. Back on the streets, I wandered over to the Spanish Steps. I took a couple of pictures of the tourists, trusting that the Spanish Steps were underneath there somewhere. Next stop, the Trevi Fountain. It was under construction of course, although I knew it would be beforehand. One thing I never realized form all the photographs is that the piazza it is in is actually quite small. There is not a huge amount of distance between the edge of the fountain and the storefronts. After more wandering, I followed some ruins, to the Roman Forum. I passed by the Trojan Market and other relics when suddenly I was hit with the image of the Colosseum. It’s funny because I did not realize how close it was as I was looking around at so many other things. When you see it, try not to say wow. It’s just so different and powerful in its history and architecture. This was on the list for tomorrow for sure. And the Arch of Constantine is right there beside it. Another marvel. I knew I would revisit this again, so I wandered on. When I came up to the Capitoline Hill, I approached it from the back and didn’t really know when I stepped into its piazza. Then I had that good old deja vous feeling. I recall being here in an Assassin’s Creed Brotherhood, as I had come to notice in many of the sites around Rome! The game, with it’s amazing artwork, storyline and virtual architecture, helped raise my awareness and eventually desire to see these places in real life. And here I was! I had by this point become very skeptical however, that one could run or even walk on Terra Cotta roof tiles. No way. Fake. The following day, like tens of millions of others before me, I took a deep breath to contain my excitement and entered the Colosseum. A feeling of awe automatically grips anyone who knows something about its history. It is nearly unbelievable that this colossal structure was built for entertainment and bragging rights…. and still stands. Nowadays arenas are built for entertainment, yes, but for profit first and foremost, generally by a corporation or conglomerate of wealthy social elitists. When you read about the gladiatorial combat that occurred here, with 11,000 animals and 10,000 gladiators on stage within 123 days of games…. just… wow. People died here under many circumstances, but all witnessed by up to 50,000 spectators. The structure is amazing. Then known as the Flavian Amphitheatre (Amphitheatrum Flavium then spoken in Latin – do you think that they italicized Latin back then too?) construction started in 72 AD, and completed in 80 AD. Eight years and how many slaves? Carpenters, stone masons, artists and engineers also adding to the mix. Enough said. Look it up and become inspired. I took a lot of photographs here. It was difficult to choose six! I was reluctant to leave, but onwards to the Paletine Hill and Roman Forum! Another huge display of archaeological amazement. Takes a while to walk through. It’s crazy to imagine how all of this (basically the city centre of Rome at the time) would have looked when the structures were all in tact. 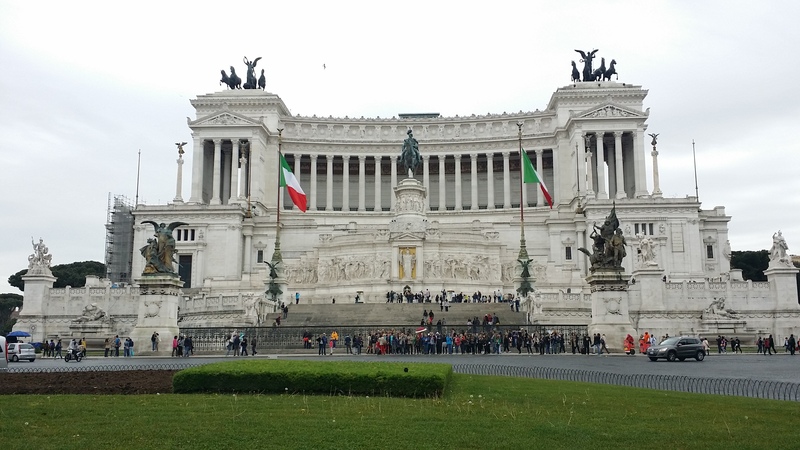 Wandering on, I accidentally stumbled across the Victor Emmanuel Monument. I had to stop and take photos of course. A monument indeed. Reacquiring my target, I finally ended up at the Pantheon. So crazy to see it in real life. Almost 2000 years old and still standing. It’s still the world’s largest unreinforced concrete structure. Although it wasn’t the sunniest of days, so there was no beam of sunlight pouring in through the centre oculus (opening) of the dome, it was nevertheless a wonder. Free to go inside too! Jason – you look so incredibly happy! See you next week in Florence! What a fantastic journey! I love reading your comments! They make us feel like we are there with you! I wish! (sigh!) Your photos are fabulous and tell such a great story! Thanks for sharing!! !